Mary McDermott and her husband, Bill Jongeward, have been involved with the Waynesboro Generals since they took in their first Generals player as a host family in the summer of 2005. With the closing of just about every home game, the Generals are fed like family by people like the McDermott-Jongewards. This past Saturday’s meal took the “home feel” that Mary tries to provide to a literal sense. 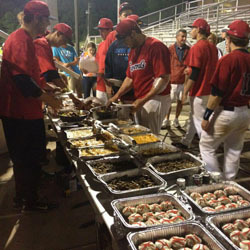 The entire team was invited back to their home for steak tenderloin and Mary’s “famous” rice casserole. In the past, the Generals were often fed concession-stand food left over from the night’s game. Thanks to people like Mary and Bill, and other members of the Generals family like Diane Lundstrom, the players are fed well. “It’s nice to have something different every night,” said catcher Ryan Breen. Even when on the road, host families make sure the players eat well, packing them sandwiches and other assorted foods that are easy to take on the road. “Sometimes it’s as simple as peanut butter and jelly,” Mary McDermott said. From home games and steak tenderloin to away games and peanut butter and jelly sandwiches, the Generals are always kept fed by their fans and supporters. And its appreciated.